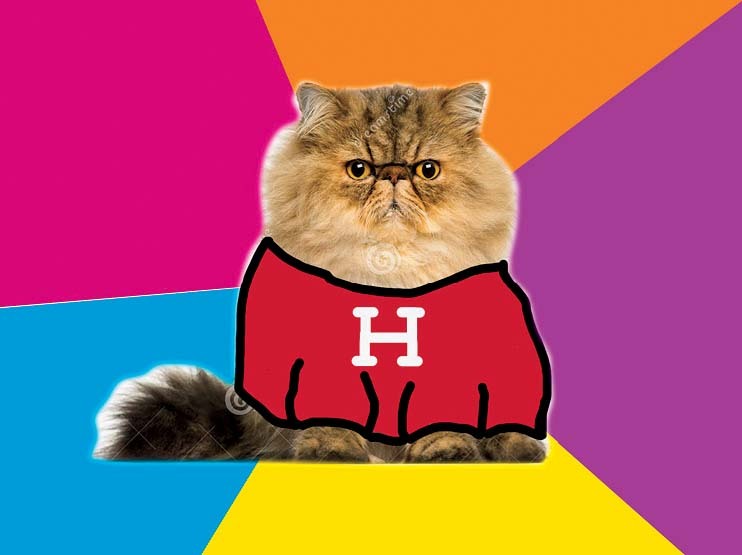 This is just one of the hundreds of images I come across while scrolling through Harvard Memes for Elitist 1% Tweens. HMFEOPT, as its users abbreviate it, is a Facebook group started in February that’s become a phenomenon on campus, one in a string of such groups cropping up at schools this year, from UC Berkeley Memes for Edgy Teens, to Brown Dank Stash of Memes for Unproductive Teens, to Yale Memes for Special Snowflake Teens. The groups are forums dedicated to sharing memes—a reference-heavy sort of humor that’s grown up on Internet social-media platforms—related to each university. It’s essentially a big game of passing inside jokes back and forth, isolating quirks of collegiate culture and exploiting them for fun. On-campus recruiting by financial and consulting firms is just one of dozens of popular targets in HMFEOPT. To scroll through the group is to wade through a swift current of allusions to all corners of Harvard life, from the particulars of swiping into certain dining halls, to the challenges of catching the Quad shuttle, to the seeming impossibility of getting a good night’s sleep. No school norm is safe from being identified as a trope and turned into a punch line. In the past, the only analysis you might get of a slice of Harvard life might be a conversation, in person among friends, or an op-ed in the Crimson. Now, an accompanying flood of memes adds another layer of commentary. By providing a space for people to share such observations, HMFEOPT has become the site of a new type of dialogue on campus. This subculture of wry analysis has grown alongside concerns about how to create a school-wide dialogue on difficult issues. Generating such a dialogue is particularly difficult at Harvard, where students spread themselves thin across dizzying arrays of commitments, academic and otherwise, and social organizations tend to divide the student body into self-selected, like-minded groups. As a result, for better or for worse, HMFEOPT might be the closest thing we currently have to a campus-wide forum. As of this writing, the group has 27,463 members. (This exceeds the total College population because current group members can accept requests from any Facebook user who wants to join.) It’s difficult to estimate exactly how many undergraduates use the group, but that total suggests that a large number do. Any of these thousands of members can post memes, making HMFEOPT a centralized, crowd-sourced trove of chatter that cuts across the student body. While much of the content addresses inane topics, the group has also been a site for sharing memes about a slew of charged issues. Following the release of the final report of the College’s Implementation Committee for the Policy on Membership in Single Gender Social Organizations (see harvardmag.com/usgso-implement-17 ), members seized on one particular sentence that proposed, as a theoretical alternative to final clubs and Greek organizations, a program of College-recognized Inter-House Dining Societies: “Societies might set special themes for some of their meals, purchase special desserts, invite special guests, eat in elegant attire, read Chaucer out loud, or anything else they might enjoy.” The idea that Chaucer could compete with final clubs’ exclusivity and lavish parties was ripe for a meme encapsulating the feeling that the administration was out of touch with its students. That day, students flocked to HFMEOPT to see how creatively their classmates could spin the joke. Theories developed about dean of Harvard College Rakesh Khurana and his secret love of the fourteenth-century poet. Never before had the cover of The Canterbury Tales been so heavily Photoshopped. One popular post featured a mock text-message conversation between a student and Khurana about what was happening on campus that night. The student writes that he’s “heard about a couple things,” to which Khurana responds, “lol like a party with alcohol and music?” and then adds, “how about u slide into some elegant attire & read Chaucer out loud w me as we dine over HUDS food @ the dhall?” About 1,000 people liked this meme. By my count, about 20 other Chaucer memes that day received more than 100 likes. By liking these memes, sending them to friends, commenting on them, and creating their own in response, HMFEOPT’s members were participating in an oblique discussion of campus politics, but it’s hard to tell where such conversations go. Yes, HMFEOPT’s inundation with Chaucer memes showed students that their classmates thought the administration was out of touch. But to what ends? The group seems to give its members the ability to ridicule the committee’s report only at a strange angle that revels in lunacy and doesn’t necessarily translate to building a robust critique. This is what’s perplexing about HMFEOPT. Because so many people use the group, it remains tempting to think that the memes might represent the desired—if idiosyncratic—inclusive discussion about Harvard. But if HMFEOPT does represent a new forum of cross-campus discourse, it’s one fueled by hyper-ironic playfulness. Any criticism that has teeth is a fringe benefit. Still, at least one aspect of memes makes me optimistic. Like all observational humor, they create a loop of recognition. The humor comes from being in on the reference—recognizing the trope that the meme isolates. Memes work like old Jerry Seinfeld bits that have you saying, “That’s so true” after he points out things people do on airplanes. In my experience, when a meme has sparked a more substantive conversation, it always circles back to how “right” a meme got it. Memes make different people aware of their common experience. If a meme takes a critical perspective on some issue, it can bring opinions to the surface that individuals may otherwise have kept to themselves, thinking they were alone. Memes can be politically constructive when they amplify discussions in real life—though the thrust of the conversation tends to be about the joy and ingenuity of the humor. To feel as if you’re often receiving your experience of the world through pre-digested tropes produces contradictory effects. It can make your experiences feel hollow, as if they don’t have the unique, authentic imprint that you romantically imagine they might. But the memes are also popular, I think, because they generate the affirmation that comes with being recognized and understood. Your reactions to the often absurd conditions of life at Harvard are validated by other people who see some of the same things and feel some of the same ways. Maybe paying attention to our tropes can work toward socially productive ends. But, at bottom, HMFEOPT demonstrates the dizzying effect of how mediated our lives are. Memes turn campus life into a sort of hall of mirrors: you recognize the things you do being recognized by other people recognizing them as things that other people do—and you get to laugh along with it. Berta Greenwald Ledecky Undergraduate Fellow Matt Browne ’17 is waiting for the special concentration track in memetics.